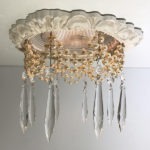 6″ Victorian Recessed Light Trim with triple strands of 8mm cream pearl chain and 3″ Clear U Drop Crystals. Made to fit Halo Type 6″ recessed lights and baffles plus most other manufacturers use Halo standards for 6″ recessed lights. Will also fit 6″ Juno recessed lights (must use Halo type baffles). Total size 9-1/8″ diameter x .625″ thick Inner hole diameter 5-13/16″ Inner lip 6-1/8″ to fit onto outer flange on baffle Baffles sold separately, MBAF 110 (white), MBAF 111 (black), MBAF 112 (Gold), MBAF 113 (Silver), MBAF 114 (Stainless), MBAF 150 hand painted to match decorative trim. Also fits eyeball fixtures, MBAF 120 (white), MBAF 121 (black), MBAF 124 (Stainless). Available in over 20 finishes Hand cast in urethane resin Awards: Top 100 Products, Residential Lighting Magazine, 2005, 2006 Beaux-Arts Classic Products originated the first ever decorative trims for recessed lights in 2003.